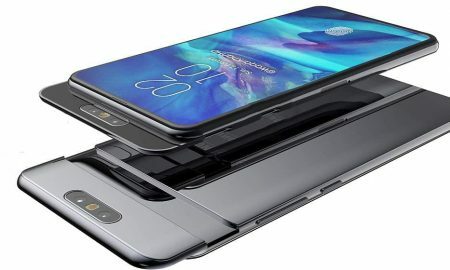 South Korean giant Samsung has once again showed its abilities by launching its Galaxy A80 which is a new midrange phone with a camera that cannot just slide up from the rear of the device but can also automatically rotate so that it can function as a selfie as well as a camera and a rear mounted camera. 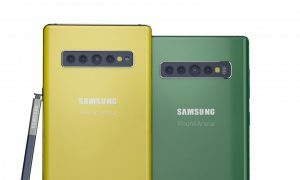 The unique camera allows the device to be the first phone to be featured on the Samsung’s New Infinity display that was announced in 2018. The A80 has an automatic pop-up mechanism that contains a triple camera array consisting of a main 48 megapiel f/2.0 camera and an ultrawide 8 megapixel f/2.2 camera and a third ToF (time-of-flight) sensor. The sliding camera mechanism has meant that there is no need for a notch or a hole punch in the phone’s 6.7 inch FHD+ Super AMOLED display. The gadget enthusiasts have earlier witnessed some swiveling cameras and slider mechanisms in smartphones but have never seen it together like this. The 2014 N1 smartphone by Oppo had a rotating 13 megapixel camera but both orientations produced similarly underwhelming pictures. The pop-up cameras have also been seen on a number of notchless devices in the past year including the Vivo Nex and the Oppo Find X. In recent times the slider phones have returned to the smartphone segment with the smartphones like Honor Magic 2 and the Xiaomi Mi Mix 3. Apart from the wonderful camera set up, the A80 also has a 3,700 mAh battery that supports fast charging at 25W. Other specifications include 8 GB RAM, 128 GB onboard storage with an in-display fingerprint scanner. The phone is available in three colors white, black and gold. Samsung also announced an April 26, release date for the Galaxy A70 that was first announced in March, 2019. The Galaxy A80 will be launched on May 29, 2019 along side the A10, A20, A30 and A50 announced in recent months.